The overseas flower market pays a premium for long-stemmed pincushions without any curvature, insects or signs of disease. To deliver such flowers are easier said than done. Depending on the cultivar, South African fynbos farmers are currently only able to export between 40% and 80% of the local harvest. Thanks to new research on growth regulators by a doctoral student at Stellenbosch University, Eugenie-Lien Louw, the cultivation of pincushions with short or crooked stems might be something of the past. Her research is hailed by some in the local fynbos industry as a "game changer”. Louw is a doctoral student in horticulture at Stellenbosch University and focuses on the cultivation of fynbos plants. 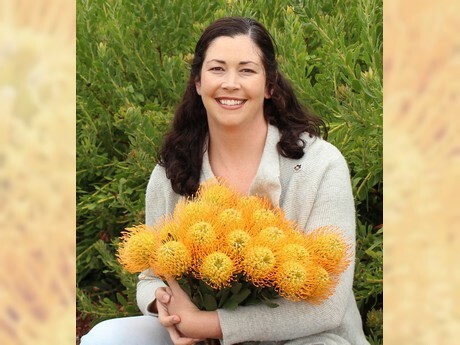 Her findings are important for the fynbos industry, as 46% of all fynbos exports from South Africa consist of pincushion (Leucospermum) cultivars. In addition to farms in the Western Cape (especially in the Boland, the Overberg, the West Coast and the Cederberg), pincushions are also grown in KwaZulu-Natal around Eshowe and Hilton. According to Louw, timing is important when applying the right combination of two growth regulators, ProGibb and Promalin. In the process pincushion bushes grow much more upright, rather than becoming bushy. Growth regulators occur naturally in plants and control all aspects of their growth and development. ProGibb is a natural version, while Promalin is a synthetic version. Similar products have been used successfully for years by table grape and citrus farmers. Louw's research is the first to show that such products can be used successfully on pincushions on a commercial scale. The mixture must be sprayed before pincushion stems are 10 centimetres long. This ensures that an ideal export stem length of between 60 to 70 centimeters in length is obtained as a rule, rather than exception. The stems also enjoy good, continuous and uniform coverage of smaller plant leaves, while well-formed flower heads are carried. "You see very few crooked stems per plant if the mixture is applied correctly and in time," explains Louw. 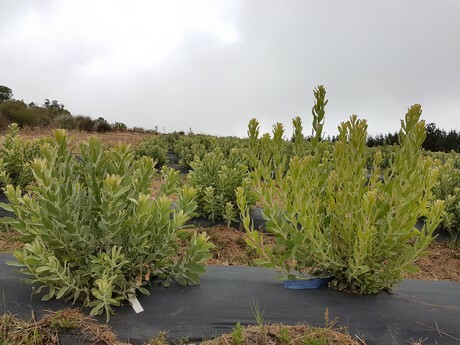 Louw has already communicated her findings to the local fynbos industry during the recent annual general meeting of Cape Flora SA, as well as at two international Protea Association (IPA) conferences in Australia and South Africa. Some local producers, especially in KwaZulu-Natal and West Coast, are already following her advice. Some refer to the treatment as "Eugenie's Magic Mix". Many recon that the input cost is worth it when it comes to their bottom line. "This is game changer for our industry, and will benefit producers directly," says Neil Hall of Philadelphia farm outside Citrusdal. Hans Hettasch, owner of Arnelia Farms outside Hopefield, also sees the treatment as a major breakthrough. 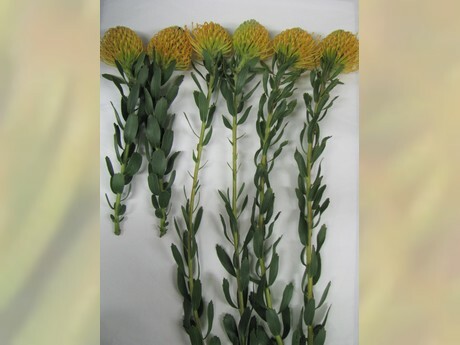 "It can have a significant positive effect on the profitability of certain Leucospermum cultivars," he says. Zuluflora's technical manager Kerry Rowlands says they have already tested the treatment and have had "exciting results". It was used in Hilton, Eshowe and Citrusdal on cultivars that typically have problems with stem length. "In most cases, the plants have shown an extra 30 centimeters of growth. The plants grow much more upright than what we are used to,” explains Rowlands, who believes that the research is helping to ensure a better product for the export market. 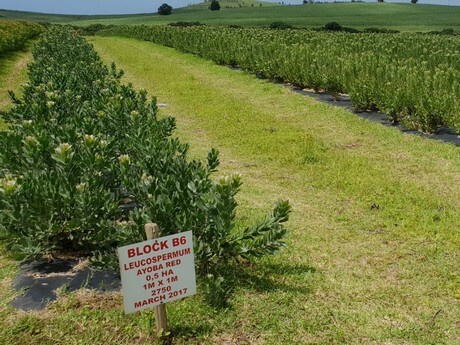 Before Louw was able to test the use of growth regulators, she had to do a thorough study of exactly how Leucospermum plants grow and develop. This is the first time that such as study was conducted on pincushions in such detail. Similar information is available for protea species. "If one knows how the plant grows, one can know how to manipulate it correctly," she explains the reason behind the initial work. Louw’s research follows on her work as technical manager of Arnelia Farms outside Hopefield. Her studies were conducted under the leadership of Dr Lynn Hoffman and Prof Gerard Jacobs of the Department of Horticultural Science at Stellenbosch University. 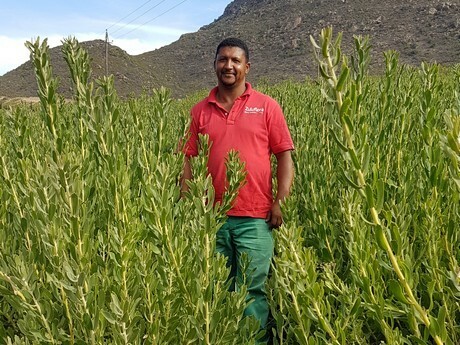 It was partly funded by Arnelia Farms and the Alternative Crop Fund of the Western Cape Department of Agriculture, which is administered by Cape Flora SA. Her trials on the use of growth regulators were done on a semi-commercial scale. It was conducted since 2013 over five seasons on two farms: Arnelia Farms near Hopefield and Pomona farm at Piket-Bo-Berg. It has been tested on two cultivars, ‘Succession II’ and ‘Soleil’. Louw tested the influence of growth regulators under different climatic conditions. She found, among other things, that it is better to mix the two growth regulators rather than spray them separately.